Change is either a great drastic thing or something that happens so subtly it is barely perceptible. So subtly it happens without fanfare or any sort of recognition. And to me, that is the best kind of change of all. Spring is coming, and my mood has changed so imperceptibly I didn't even realize it until today. The weather was heavenly, and had a strange guilt inducing effect on me. Today was laundry day and I desperately wanted to be where the laughing and squealing and sun were all whirling and frolicking around in a kaleidoscope of youth and Spring time. I didn't want to be in the basement sorting through and hanging from the cliff of laundry. My penance from having skipped laundry day last week. As often as I could, I stole up the stairs to find my kids, barefoot, running around in the back yard, tasting the freshness of the air and the warmth of the sun adding color to their cheeks. I wanted to be with them. But we were running out of things to wear. As a compromise, we ate lunch outside. 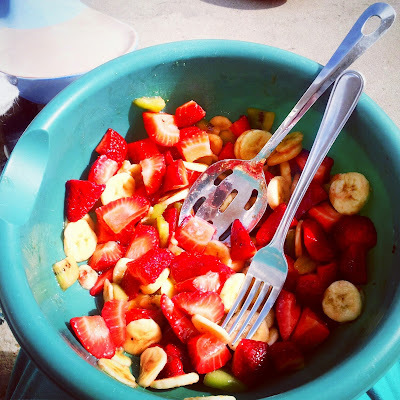 An incredible fruit salad seasoned with the intoxicating flavors of fresh air and warmed by the gentle rays of the sun. And then I had to go back to laundry and cleaning. Because it is only going to get warmer, and if I get ahead now, then we can all rejoice with the sun when it is in the 60's. Sacrifice now to enjoy later, right? Eventually their play brought them indoors. I overheard some of it, and I had to giggle. The Doctor and Rose were rushing around saving Earth. I love how they play so well together. They are thick as thieves and I hope they always stay that way. After a bit, Faye decided to play with some farm animals and Keith had to be authentic and get dressed up. Most of the time he was wearing his suit jacket, but by the time I got some pictures, he had removed it. About 5 minutes after the above picture was taken, he zonked out on my bed. I tried covering him with a blanket but he wiggled out of it. The time was 6:30. I tried to wake him up, knowing if he slept then, he would not want to go to bed an hour later when it was his actual bedtime. I tried and tried to wake him up, but he wouldn't. I eventually got him moved to his own bed and under the covers. I brought him his dinner in bed, and he just lay there, sniffling, and coughing with such an awful cough it broke my heart. He has officially caught Faye's cold. And he sounds worse. Poor boy. But usually with him, he gets worse, but better faster than her, so I am hoping it has something to do with the potency. I was right. He was up and about an hour later, somewhat lethargic, but didn't want to go to bed until after nine. I figured as much. Those pics of them playing are so cute. But I'm sorry your little guy is down with a cold. Hope he rallies soon! Bummer- hate when they get sick. Love how much they play together and how fun they have. Lucas and Alex used to -- but lately they have started fighting more than playing, driving me crazy! The picture of them on the bunk bed with just their heads peeking over is TOOOO cute! You are doing the best you can! I hope the sunshine is helping!